‘Play me, I’m Yours’ huwa festival ta’ mużika u arti mill-artist Luke Jerram, li ilu jittella’ madwar id-dinja sa mill-2008. 15-il pjanu ser ikunu mqassmin f’postijiet pubbliċi madwar Malta u Għawdex bejn it-22 ta’ Settembru u d-9 t’Ottubru 2011 bħala parti miċ-ċelebrazzjonijiet ta’ GM For You! Dawn ser ikunu f’diversi lokalitajiet, u ser ikunu jistgħu jindaqqu mill-pubbliku. Barra minn hekk dawn il-pjanijiet ser jiġu wkoll dekorati minn artisti Maltin flimkien mal-pubbliku biex b’hekk tinħoloq sintonija bejn il-mużika u l-arti. L-għan ta’ dan il-festival hu li l-pubbliku jersaq aktar viċin l-arti u l-mużika. Permezz ta’ dan is-sit tistgħu tibagħtu l-kummenti u taqsmu l-esperjenzi tagħkom, b’xi filmati u ritratti madwar il-pjanijiet. Wara l-għeluq ta’ dan il-festival il-pjanijiet ser jingħataw lill-iskejjel u għaqdiet volontarji. Ikklikkja fuq il-post hawn taħt biex ittella’ u tara l-films, ir-ritratti u l-kummenti tiegħek. 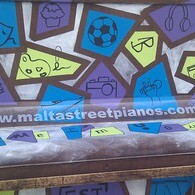 From Thursday 22nd of September until Sunday 9th October 2011, 15 street pianos were distributed across the streets of Malta and Gozo to celebrate the GM For You! 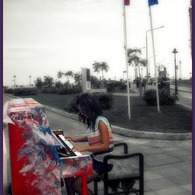 Located in public parks, streets and squares, the pianos were available for any member of the public to play and enjoy. 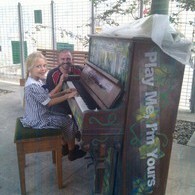 The pianos were also free for the public to decorate and personalise. 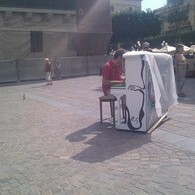 This website was made for the public to post their comments, films and photos about the pianos. 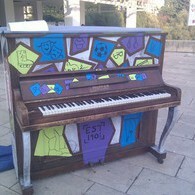 Whilst documenting each piano’s journey, the website connected the pianos and their communities across the city. 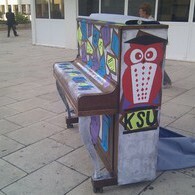 After being in place for two and a half weeks, the pianos will now be donated to local schools and community groups.